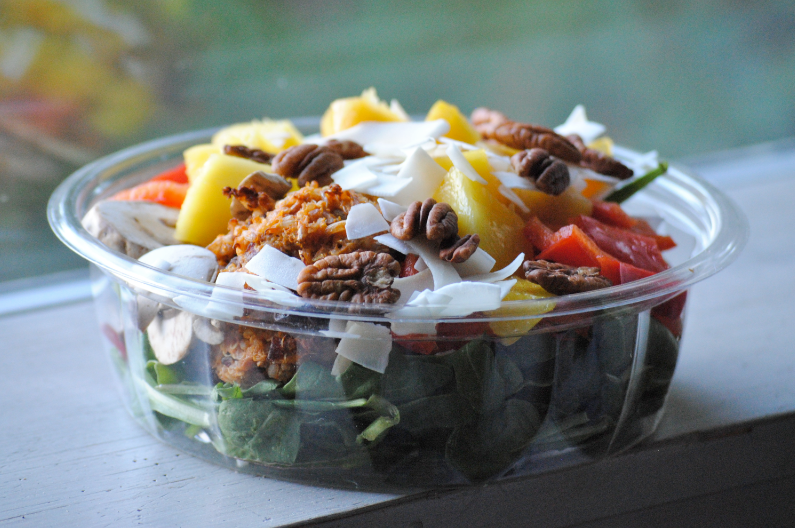 Big Salads for the Win! When it comes to salads, many Americans think the formula is: Iceberg lettuce + ranch, end of story. No wonder a lot people don’t think you can have salad for a meal! 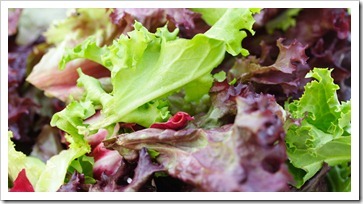 In truth, building a salad for a meal – a good salad – is a bit of an art form, but there is some method to the madness. Today, I’m going to share my formula with you. There is no iceberg lettuce or ranch involved! I have eaten a big salad for lunch just about every day since November, when I set out to battle hypothyroidism without meds. You don’t hear me talk about hypothyroidism anymore because I identified it early and successfully squashed it. At 36, have truly never felt better. I really believe the turn around in my mood, energy levels, and just overall zest for life is due to a dietary shift I made and have stuck to. I ditched the gluten, shifted focus to nutritional values over calories, and have generally cut out the extra junk. I already ate pretty well by most people’s standards, but, taking it up a notch made all the difference. And, the foundation of that shift is my daily big salad. Truth be told, this big salad discovery was a bit of an accident. 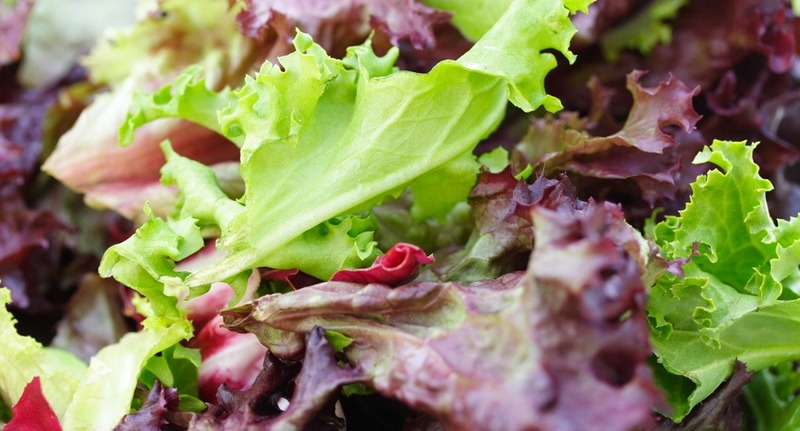 I was doing the Be Well cleanse, and the only way I could figure out to eat according to program guidelines — while simultaneously not having a kitchen – was to do it in salad form. I ended up really digging my big salads. Pure serendipity. 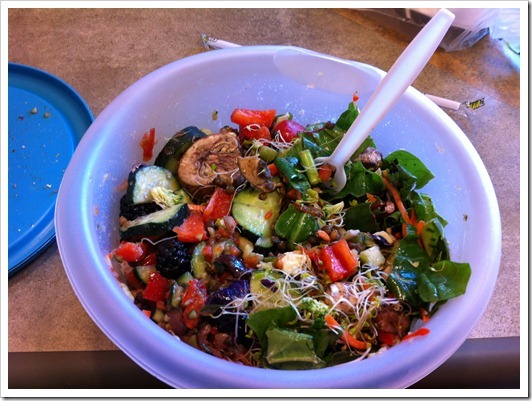 To make a lunch salad that you can take to work, obtain a durable reusable bowl/container that holds 6-8 cups. You want to have room so you can shake it up to distribute the dressing without needing a ton of dressing. I buy a lot of pre-washed/prepared fruits and veggies for convenience sake. You certainly don’t have to do this, but I find it worth the little extra cost at this time in our lives. Here is the simple formula, and I go into much more detail below. 1-2 handfuls greens + 1 handful sprouts, herbs, and fungi + 2 handfuls chopped fruits and veggies + 1 serving protein source + 1-2 servings healthy fat + 2 tablespoons homemade dressing+ any optional spices/powders/add-ons you like. Here is a snapshot of my lunch from the other day. As you may be able to see, we were at Subway. I just bring my own food (and fork) and buy a drink (unsweetened iced tea) so 2Chili can have his daily sandwich. Since we both work from home, getting out of the house is fairly important. I like to support the greens with a bit of flavor/crunch. I usually just put in a little bit of this/little bit of that to add up to about a handful. This completely depends on what is available and in season, but I usually add 3-4 items (chopped) from the below. 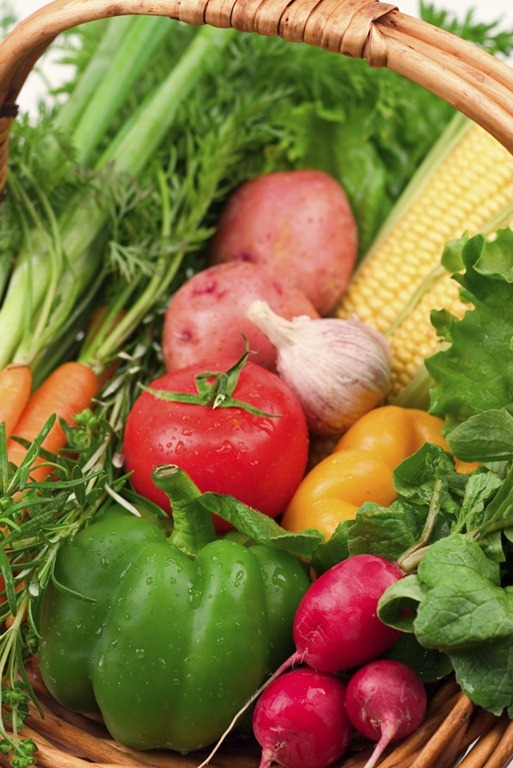 This is of course not an exhaustive list of veggies and fruits, so go with what you like and is available! Note: I have been buying the Trader Joe’s Healthy 8 chopped veggies from the cooler section. This saves a lot of time chopping! It is also good in stir-fries. Beans of any kind like kidney, garbanzo, pinto, white, black, etc. This is key to making your salad stick with you, and it makes it taste so good too! If you are watching your weight, just keep an eye on portions, as this fat is definitely good for you, but it does have a high caloric density. 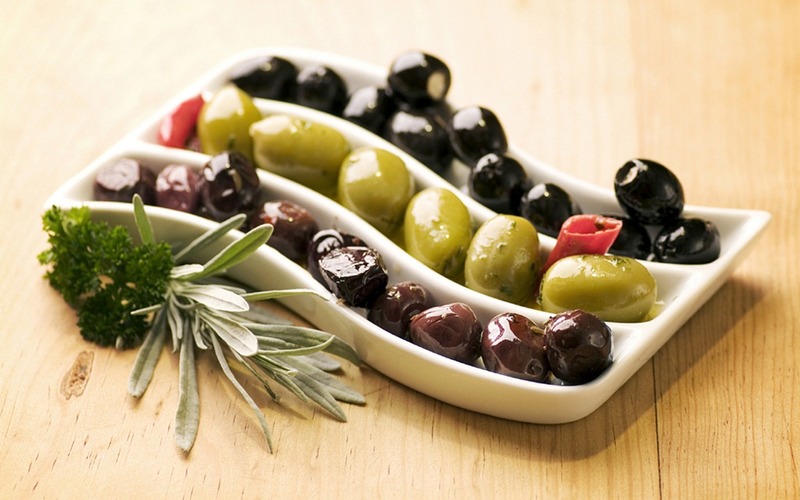 Olives: Black, green, or Kalamata, they’re all good! 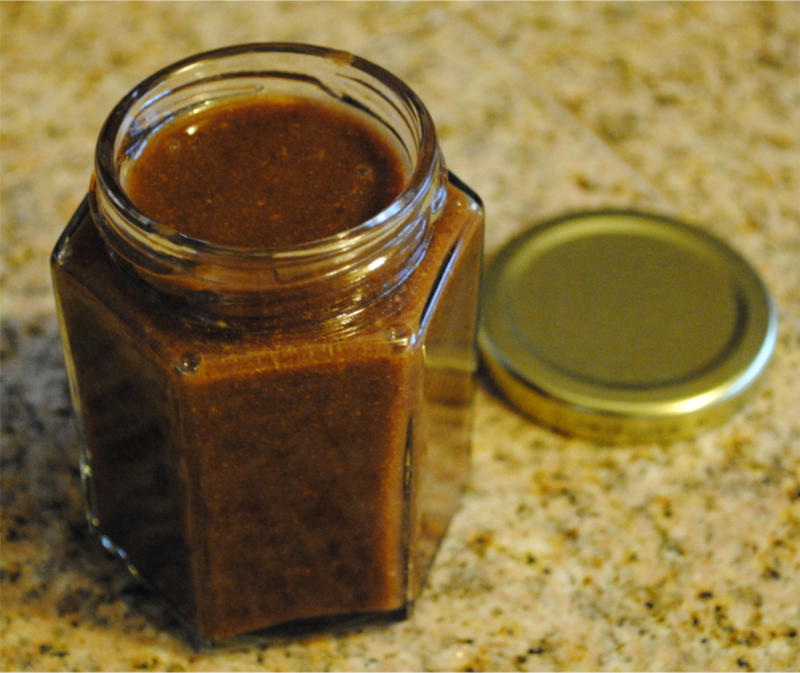 Making your own salad dressing is super, super easy, and so much better for you than store bought. There are a ton of recipes out there, but here is my tried and true simple dressing. I go with 2 Tablespoons, and then shake, shake, shake the container to get everything evenly coated. Nutritional support. This is the bucket for things that don’t really fit in the other categories! A sprinkle Dulse Powder adds iodine, a vital nutrient that helps pull heavy metals out of our bodies, and doesn’t add any flavor. A tablespoon of cacao nibs adds crunch and lots of antioxidants. Once you have all your items in the bowl, put the lid on, shake well, and prepare to enjoy a great, healthy, nutritionally-balanced meal. The sky is truly the limit as to what you can put in your ultimate salad. I make mine different every day to keep things interesting, but usually follow the framework above. If you use a tracker like MyFitnessPal, you’ll be amazed at how many of your RDAs are achieved after inputting just one salad. 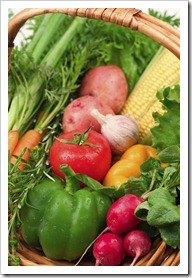 It is better than any vitamin or supplement you could take for getting your body what it needs to serve you best. I’ve had to get fairly creative with food prep lately due to the Be Well cleanse I’ve been doing (review coming Monday). It’s not because the food on the cleanse is hard to make or even that restrictive, it’s just that, well…we have no kitchen. As a result, I have really perfected how much produce I can maintain in our little dorm-sized fridge, and I prepare salads and other simple dishes to bring with me wherever 2Chili ends up wanting to eat for the day. Amazingly, with proper space management, you can fit quite a lot into a little fridge! This is one of my favorite salads of late. It reminds me of a warmer place, as Seattle in winter can get kind of dreary (did I just state the complete obvious?). 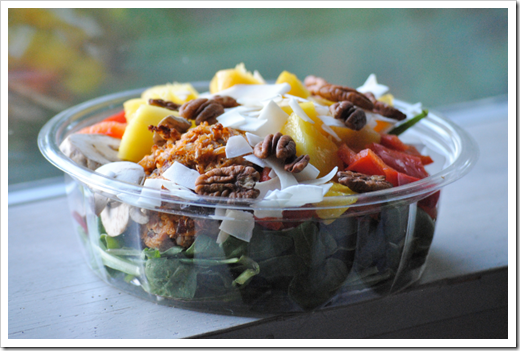 I love fruit mixed with salad, and this combination of mango and coconut with the greens and peppers really works! This salad packs a nutritional punch, including lots of fiber, a spectrum of vitamins, healthy fats, potassium, and protein from the quinoa. 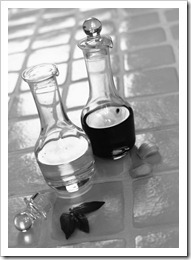 I’ll be back on Monday with my thoughts on the Be Well cleanse. Have a great weekend all! Okay, it’s not like that ALL the time, but, when I have some crazy idea in my head that I want to do, it is not unusual for one of us to be eating grilled cheese (and I’m sure you gather which one that would be). This salad may be a little surprising because I used garbanzo beans as a bit of a filler (they are a magic worker, those chickpeas). They extend the more expensive item (salmon) and add some nice texture on their own. I think this filling would be good in a wrap with some sliced avocado as well. In other news, I have started putting all my old recipes into Recipage. It is super cool! If you write a food blog and struggle with the age-old problem of how to get user-friendly, searchable and printable recipes into your blog without a ton of work, check it out – it’s totally free. If you already have a large recipe database, it does take some set up time, but I’m approaching it on a “as I have time basis,” and maybe will get everything moved over sometime in 2012! In a medium bowl, combine salmon, mashed garbanzo beans (or mash them in the bowl), and hummus. 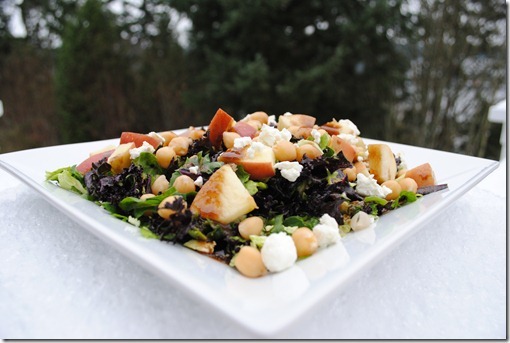 Since I am going it alone in Seattle this week, I thought I would share a recent favorite salad recipe today instead of a normal Test Kitchen Tuesday recipe. The salad base is very seasonal right now, as kale is a winter crop. 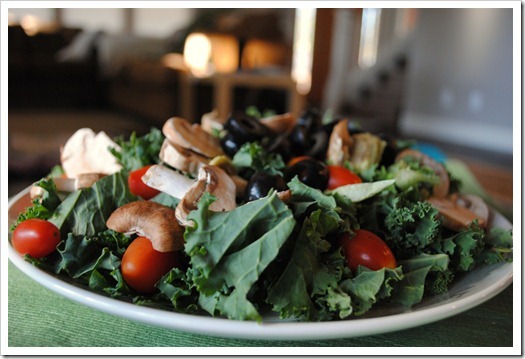 High in vitamin K, C, A, manganese, and even fiber, kale really is a super food, and a hearty kale salad can really hit the spot. with a bowl of soup or sweet potato on the side. I threw this together a couple of times last week and found myself really craving its flavor combinations. Can people crave kale? Yes, I do believe so. This makes a HUGE salad, all for under 400 calories, including the dressing. 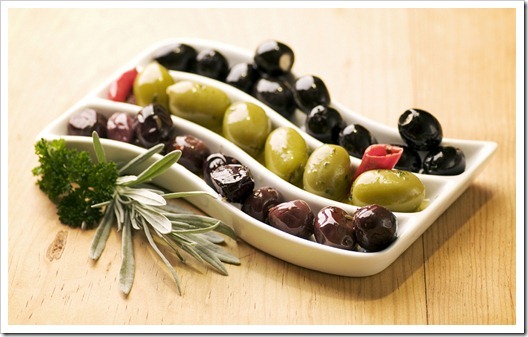 While it is somewhat high in fat, it is all from healthy fat sources – avocado, olives, and olive oil. 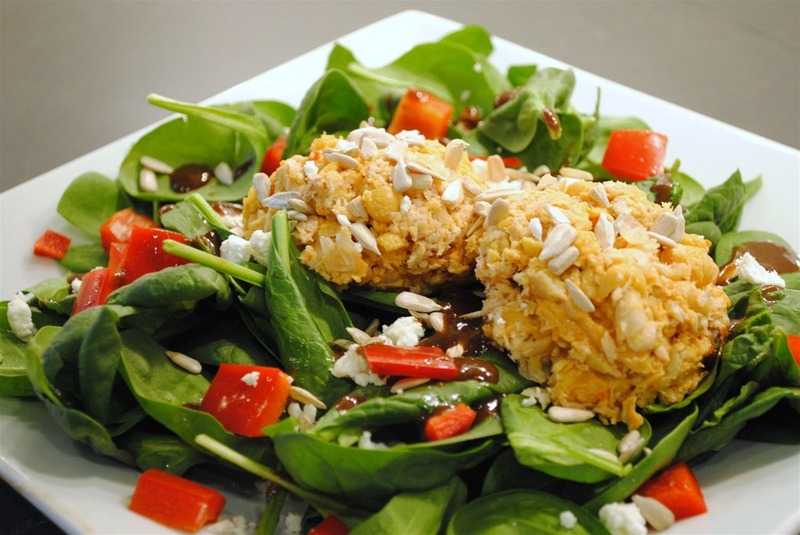 This salad will keep you full from lunch until dinner. 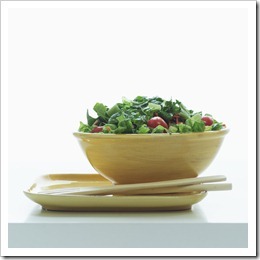 I have had this picture of one of my favorite big salads on my memory stick for a while now. I took it a while back when we had snow in Seattle, which is kind of a rare occurrence, though lately it seems to happen at least once a year. Today, we are just about drowning in rain, which is far more par for the course.. I have been saving it up for the right time to write about it, (you may have discovered I have too much to say) and I keep delegating it to the bottom of the “to blog” pile. No more! Today is the day. 2Chili calls me the “mixer” (that’d be in addition to “vaccuum queen,” in case you’re wondering) because I am notorious for just mixing up a random assortment of things on a plate. And, that is, for the most part, true. I’m a mixer. He’s a segregator (don’t let anything touch anything else – or we’ll have trouble!). Amazingly, we live in mostly harmonious accord. 2-3 cups of of something green for vitamins. In this case, I had chopped brussels sprouts, purple kale, and some arugula. Trust me. It works. 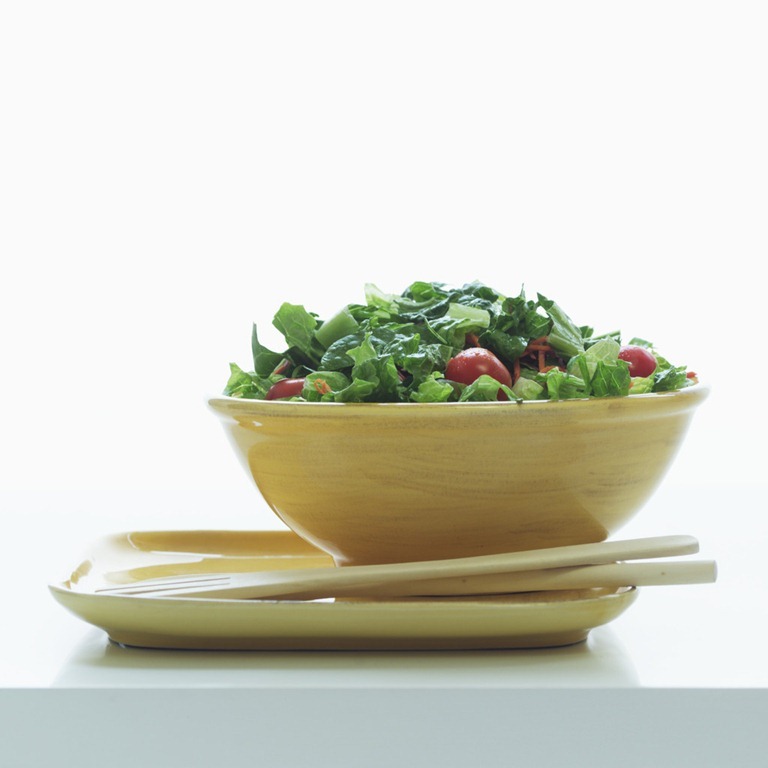 You could choose from a rainbow of greens – chard, green kale, mesculin, or even simple romaine. 1 ounce of cheese for protein. My go-to is goat cheese, but feta crumbles, part skim mozzarella, chunked 2% cheddar would all be good choices. 1/2 cup legumes for protein and fiber. In this case, I used chickpeas, but lentils, white, or black beans are also good. I usually make up a fresh batch of a different kind of dried bean every weekend, save out some, and freeze the rest in small containers, that way I always have some at the ready, and there’s always variety. 1/8 cup nuts for healthy fat. 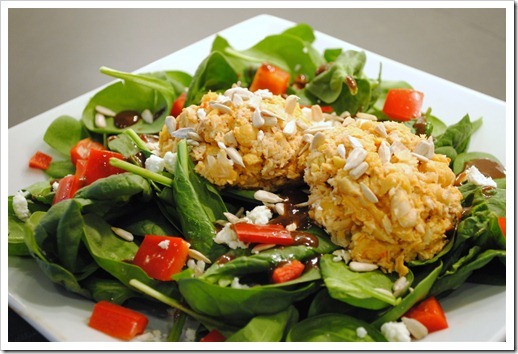 I used chopped pecans in this salad, but any nut is good – just not too too many – the fat and calories add up fast. Walnuts and cashews are good options, as are roasted pumpkin seeds (petipas) or sunflower seeds. 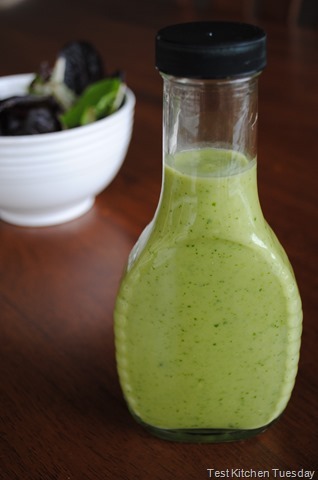 2 tablespoons homemade dressing. 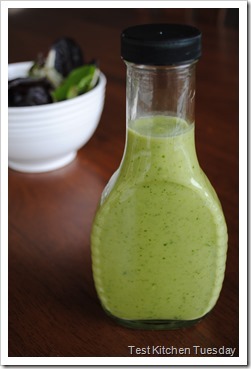 I used this dressing – it is simply awesome and comes together in a jiffy. If I have some cooked and ready, I have been known to toss on 1/2 cup of roasted cubed winter squash like butternut, acorn, kabocha, or, my favorite, delicata for some beta carotene. 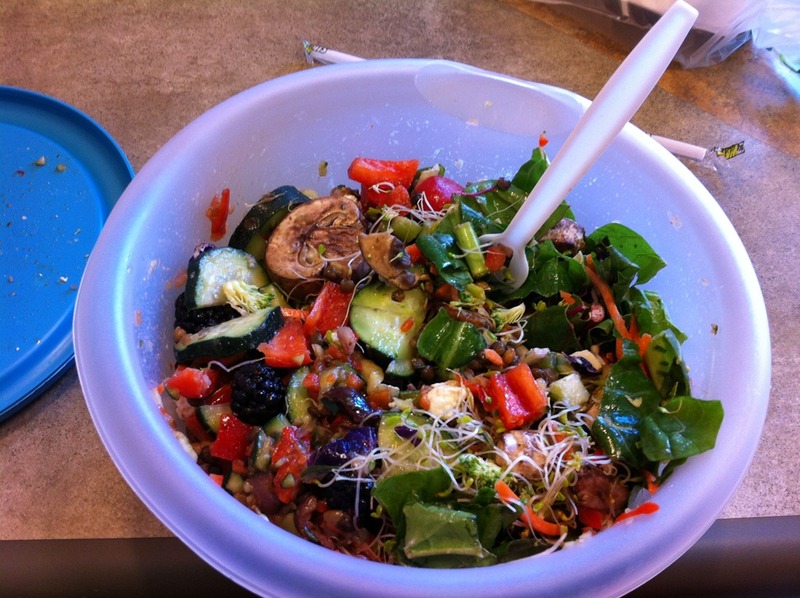 And there you have it – a big salad with big taste and big nutrition! Thanks for stopping by, and Happy Friday! 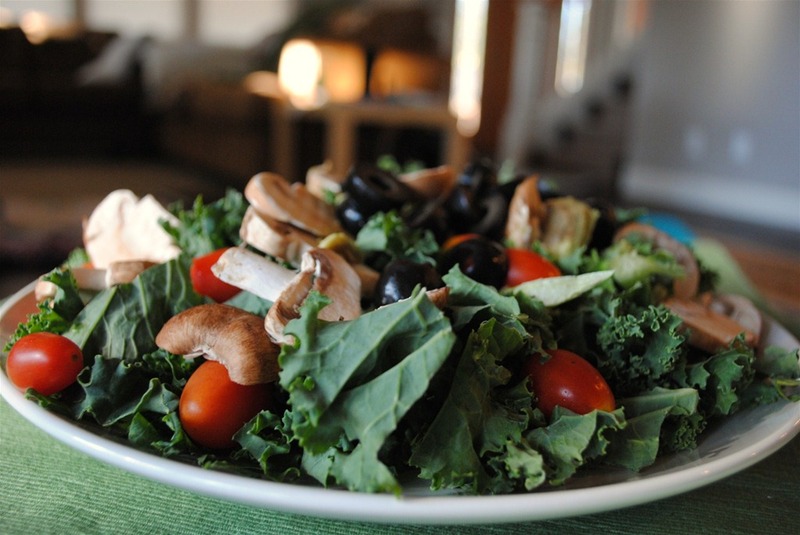 As a frequent salad eater, I consider salad dressing an essential staple item, as I use it 5-6 times a week. But, truth be told, commercially-prepared salad dressings are full of preservatives and other undesirable items so they can sit on the condiment shelf in your fridge for years on end and still be edible. I used to have an array of such bottles, and never really considered what it took to create and stabilize the dressings so they could last so long. Now days, I don’t have any commercially-prepared salad dressing in the fridge. I whip my own in small batches – just enough to last a week or maybe two. 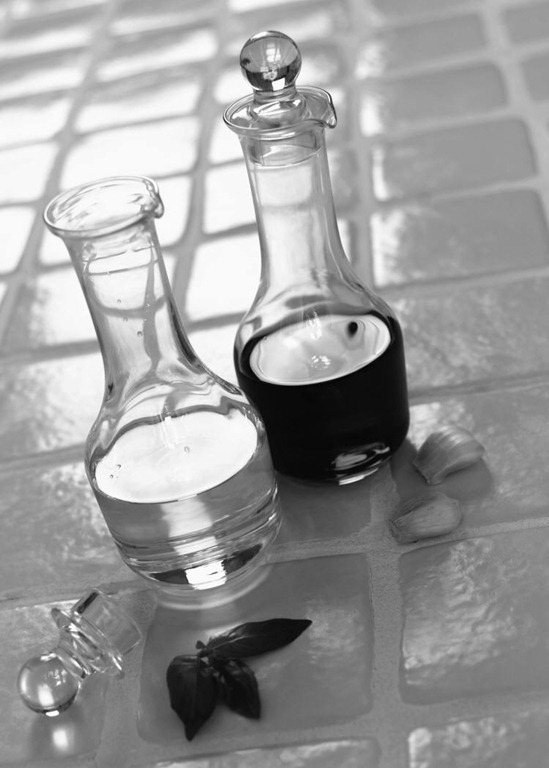 On the right is the ingredients list from Newman’s Own Light Balsamic, which is one of the better ones on the market in terms of ingredients and nutrition, and it’s really not that good at all! 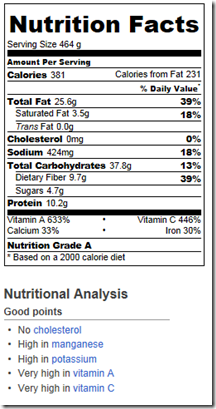 My biggest beef with commercial dressings, ingredients aside, is the sodium count. 390 mg of sodium for something with only 45 calories for 2 tablespoons is pretty crazy! And, honestly, who eats only 2 tablespoons? 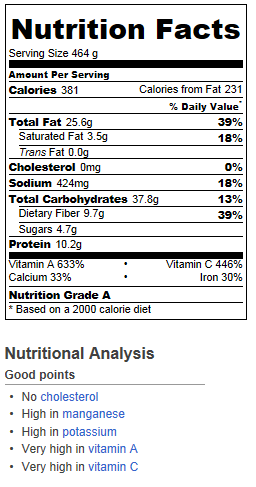 This is a pretty good example of where you really need to look at the big picture, not just the calories. It doesn’t have to be, though! Homemade salad dressing is easy and fast, and you only need four ingredients to whip up the best tasting topping for your greens you could imagine. I have been wanting to share this dressing recipe for some time now, but I always forget to measure when I’m making it up, so it has been on hold now for awhile. I usually just eyeball the ingredients, but, yesterday, I finally remembered to measure! Based on low sugar raspberry preserves as the sweetener.